Following success with their international debut last year in the us, canada, Australia and New Zealand, band members Max George, Nathan Sykes, Tom Parker, Jay McGuiness and Siva Kaneswaran will bring their unmistakable vocals to Scarborough, boy band. the wanted 14 june 2013. Critically acclaimed, alternative ‘Manchester’ rock band Happy Mondays will bring their unmistakable sound to the Scarborough Open Theatre. Scarborough Borough Council can also announce that 808 State, whose top-10 hit ‘Pacific State’ is instantly recognisable almost a quarter of a century later, will support Happy Mondays at the theatre. Alternative Manchester Rock Band. 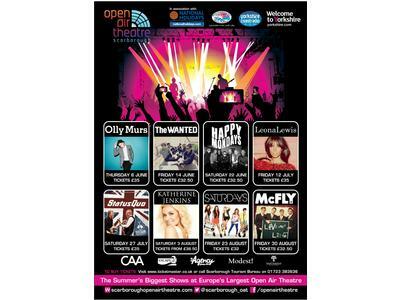 happy mondays 22 june 2013.
groups: We currently offer great discounts for anyone wishing to buy more than 10 tickets to one of our events. 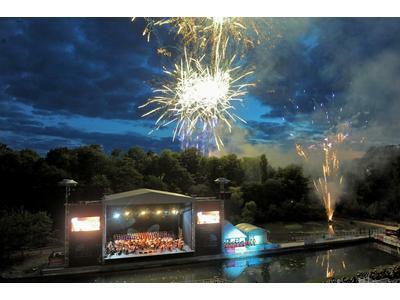 catering: The Open Air Theatre has a range of food and drink outlets on site. These are located either side of the main grandstand and at the back of the terraced seating. We sell a tasty range of hot and cold snacks and soft and alcoholic drinks. We regret that no personal food or drink can be allowed onto the site for any event, with the exception that we allow customers to bring in one sealed bottle of water per person. This is a health and safety requirement which everyone is asked to adhere to. We thank you for your co-operation. 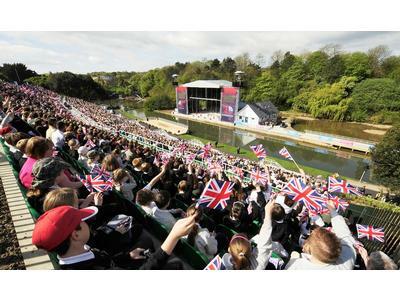 access: The Scarborough Open Air Theatre is fully accessible to all our visitors. Our facilities include accessible parking spaces, a drop off point, ramps and accessible toilets. There are specialist seats along with disabled and carer seats. Please ensure you inform the operator at the time of booking if you have any special access issues. Please note that Yorkshire Water are currently undertaking major works to improve Scarborough’s waste water pumping, storage and treatment facilities. As a result, when leaving the venue you will need to follow the Open Air Theatre diversion signs as you cannot access Foreshore Road from Marine Drive. toilets: There are plenty of toilet facilities around the site in order to keep queues to a minimum. Baby changing facilities are also available in some washrooms. parking: There are plenty of parking areas all around the venue site. Parking will be suspended on the main road directly in front of the Open Air Theatre (A165 Burniston Road) on event nights. This is mainly to ensure pedestrian safety. The suspension in place will mean that there can be no parking, stopping or waiting on Burniston Road. Drivers who are dropping off/ picking up passengers on event nights are asked to do so on Royal Albert Drive.